I am so pleased to introduce a guest post from Audra of Cherished Bliss. You may be familiar with Audra as the author of Once a Mom Always Cook but, as you will read, Audra is joining forces with another gifted cook who she knows quite well. Audra has been a respected friend since I began my food blog and she was very kind to share one of her favorite quinoa recipes with all of us! First rinse butternut squash and dry. Pierce the butternut squash with a knife in multiple places all around the squash. Place on a paper towel and microwave on high for 4-5 minutes. Just enough to soften the squash so you can comfortably cut, slice, and peel without struggling. Once the butternut squash is done peel, cut open, clean out center, and dice into bite size pieces. In a large saute pan melt butter over medium heat. Add diced apples and butternut squash. Sprinkle brown sugar, cinnamon, and salt over the mixture. Combine all ingredients and cook over medium heat for 8-10 minutes, stirring occasionally. Turn off heat, cover with lid and let the mixture sit for another 5-7 minutes. 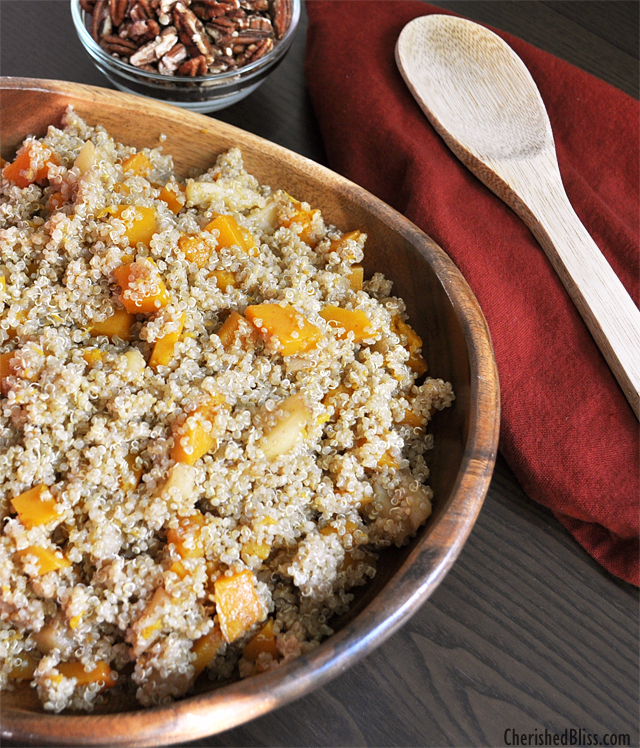 In a large serving bowl gently combine the caramelized apples and butternut squash with the quinoa. Garnish with toasted pecans. Best if served warm. Directions for toasting pecans: Heat oven to 400 degrees. Line a baking sheet with parchment paper and evenly spread 2 cups of chopped pecans on baking sheet. Mist with cooking oil and toast for 5-10 minutes, stirring half way through. I cook my quinoa in vegetable broth to add more flavor. For this recipe, I use 1 1/2 cups quinoa to 3 cups broth. Also, you may leave the apple peels on to add more natural beauty this this dish. I used honey crisp apples in my recipe, but you may use any variety of apples you wish. 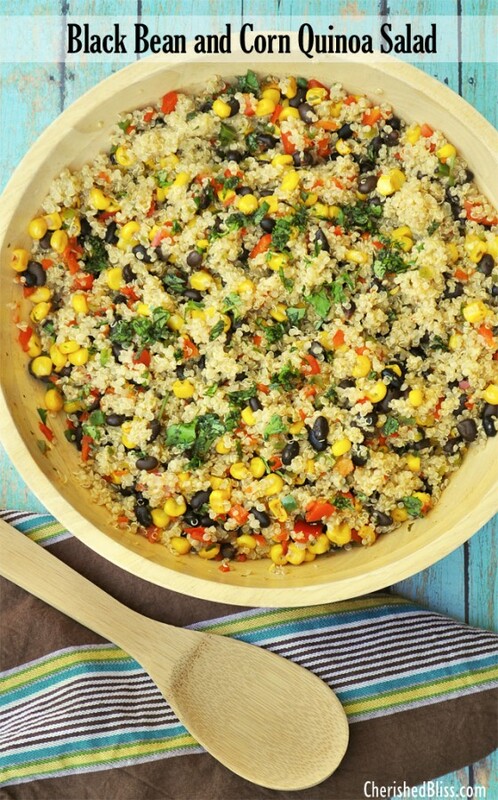 If you are looking for more ways to prepare quinoa salad check out my recipe for Black Bean and Corn Quinoa Salad. Please also visit our Facebook page for more fun family recipes! Thank you so much for having me! It was an honor to be here. Thank YOU for sharing this recipe, Audra! I look forward to a big bowlful!